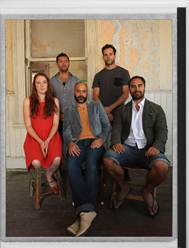 With only a week to go until we premiere Sydney Bridge Upside Down to audiences in New Plymouth we thought you might all like to hear from Director, James Ashcroft on what he hopes to achieve with this production – his debut directorial work. What are you and the team hoping to create? How does Sydney Bridge link in with Taki Rua Production’s long-term vision? We feel responsible for interrogating and exploring the form of theatre so that we can play a part in moving it forward - we want to be a part of what the future of theatre is, what it will look like and the potential it has to effect contemporary audiences – SBUD sees us taking the first steps in that journey. Together we’re playing with different forms and styles of theatre, combining them or going against them in a way that surprises us and hopefully our audience – with this work David’s words are the anchor, the reference point that we can bounce off and come back to – they have in a way created a door or launching pad into this new way of making that we are exploring. Why are you staring away from traditional storytelling with this production? Of course within the work a narrative will exist, as with any collection of moments that are linked together. This aspect of theatrical storytelling is not the main element we are wanting audiences to experience though. I suppose we are wanting them to respond to the form more - the “how” of this work and not the “what”. We are wanting to engage them in a conversation about how theatre effects them – how this piece of theatre effects them. From there we can measure how successful we are in our artistic endeavours and ultimately create better, stronger, bolder works that have bigger impacts on future audiences. You are have a strong personal connection to Ballantyne’s novel – how does the come across in the production? As a director a big part of this work is me exploring my journey through life. 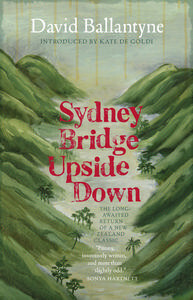 Sydney Bridge Upside Down has given me the opportunity to look at what it means to be a man in today’s world, what it means to reconcile my past and to examine what my place in the world is. David opened up a world that seemed to fit so well with the life questions I had – his story gave words to my questions about the world and now I’m challenged with the task and exploring every detail of these questions so I can open them up to others through the production. What is about the form of theatre that inspires you? I see such value in theatre – live performance and the immediacy of it is so hard to find in other forms of art and entertainment – I can’t help thinking we can take advantage of that more, push the boundaries of that intimate relationship with an audience more, use it to combat the often anesthetising effect of things like television – we’re not looking at creating an aggressive work but at the same time we want our audiences to be conscious throughout so that they can fully engage with some of the questions we are exploring and we want that because we’d like to know how they perceive these questions - if and how they are relevant for them.